A more familiar name in peanut butter—Jif—is now also selling single-serving portions of peanut butter in little cups that come in six packs. The Jif cups are easier to find at grocery stores than Justin’s. Some people like the smooth, familiar taste of PB like Jif better than natural, grainier brands. Jif peanut butter cups are not as healthy as Justin’s packets. They’re not organic, and they contain fully hydrogenated vegetable oils. Fully hydrogenated oil doesn’t contain trans fat, but it’s still highly processed which is not necessarily good for you. Jif’s single-serving packets are a bit too big! The cups contain 64 grams of PB, which has 390 calories, as opposed to Justin’s 100-calorie packets. That’s fine if you’re making a meal out of it, but too many calories for just a snack (and who has the willpower to only eat half of a tub that’s called a single-serving tub?). If you do buy them, my trick is to scoop one big tablespoon of it out into a small plastic container, seal it, and put it into the fridge right away. Decrease the portion a little in the beginning, or you’ll never do it later. Tanya Taylor is a PhD and a food chemist for a food ingredients company. She also runs the excellent blog I Ate A Pie.net. She knows her stuff! (And she’s very nice, too.) In her review of Jif Creamy Peanut Butter To Go she says that "Jif To Go is an absolute no-no." Check out Tanya’s site – it’s really great. Packaging Close-Up: Do the Justin’s Squeeze Packets Really Work? 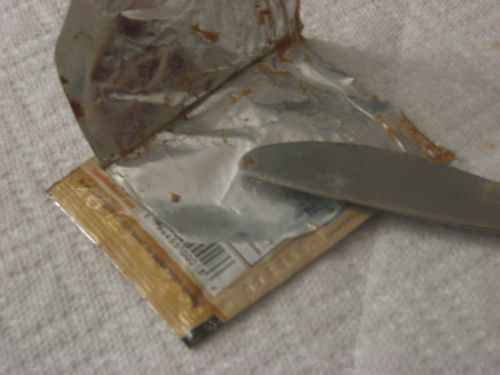 I told you about the taste and nutritional value of Justin’s nut butters, but how easy are the squeeze packets themselves? Here’s my photo story review. I bought the 1.15 oz squeeze packets of classic almond butter (the .6 oz 100-calorie packs are just not enough for me), and I took one of them with me to work, along with a whole-grain roll. My plan was to make a little almond-butter sandwich. First, you’re supposed to knead the package. The natural oils in almond butter cause a little separation, and kneading ensures you get a well-blended product. Once you rip open the packet, you’re supposed to squeeze out the almond butter and enjoy. HOWEVER, when I was done squeezing it onto my bread, I could feel that there was a bunch of it left that I couldn’t seem to get out. So I grabbed a knife and dug in to the package. I started getting frustrated. The knife method wasn’t working that well—I couldn’t seem to scrape out that last bit stuck in the bottom. And I am not one to waste delicious food! I was still hungry. I needed to get that last drop. Finally, I savagely ripped the whole package apart with my hands. Victory! I got you, almond butter! There was even more left in the package than I had realized! I guess I hadn’t kneaded it as well as I thought. All the moist almond butter had squeezed out, and this drier stuff was left at the bottom of the package. The remaining part may have been dry, but it was still tasty. The packets aren’t perfect—they’re harder to use than a tub or jar—but they’re so small and they fit so easily into your bag that they’re worth it. (Plus they’re such a big help with portion control.) Just bring a small plastic knife or spoon with you to work, to aid your squeezing.